Powered by a choice of V6 and V8 engines driving the rear wheels, the Cadillac STS features a distinctive exterior and a comfortable ride. All-wheel-drive is an option. Changes for 2010 are limited to two new colors, Vanilla Latte and Tuscan Bronze ChromaFlair. 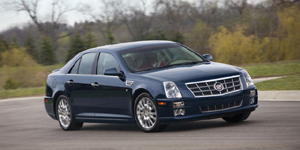 The high-performance Cadillac STS-V has been dropped from the lineup for 2010. The 2010 Cadillac STS Sedan is powered by a base 3.6-liter V6 with 302 hp. Also available is a 4.6-liter V8 with 320 hp. Find the used Cadillac STS of your choice from a dealer in your area. Search our used car listings now.